Welcome to the Replica HM Bark Endeavour, the only full-size replica of the world-renowned Captain James Cook in the Northern Hemisphere, and is one of only two such vessels in the world! So what more romantic, dramatic, beautiful and inspirational venue could there be for your event.... and all with modern service facilities! 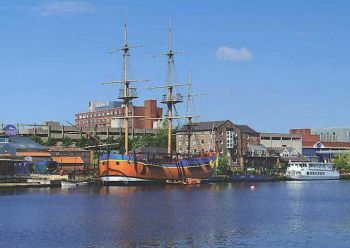 Berthed on the beautiful River Tees at Stockton-on-Tees in a tremendous location, not far from the birthplace and land of the boyhood of James Cook , we possess a unique facility for Events, Private Functions, Weddings, Corporate Events, Re-enactments, Commercial Filming, Themed Events and Special Dining Events. Click here for details of our Midweek Budget Brides Exclusive Packages! NEW WEDDING PACKAGES FOR 2014. Welcome aboard this full size replica of the HM Bark Endeavour, used by Captain James Cook on his first voyage of discovery to Australia. Our friendly and knowledgeable guides will give you a fascinating insight into what life at sea was like in the 18th Century. An audio information system is available at strategic locations throughout the vessel. The atmosphere on this historic quay, mixing with street traders and sailors of the period. The cabins are exhibited as authentic for the voyage and many other artefacts are displayed for information about the period. Price: Adult £4.00 Child £3.00 Evening events can be tailored to suit individual requirements. Contact us for details and availability. This is a full size replica of the Whitby built collier used by Captain Cook on his journeys of exploration. As a consequence of authenticity the vessel contains steep stairs and narrow passages which are not easily accessible to people with special needs. Wheelchair access is available on to the main deck level but thereafter movement is difficult. Please contact the booking office prior to your visit. The splendid Captains Cabin, with magnificent views of the river will accommodate up to 20 people for a sit down function. The atmospheric Main Deck with traditional rope tables and seats will permit up to 30 people seated. The Orlop Deck with bar and entertainment will accommodate up to 60 people seated depending on function type. 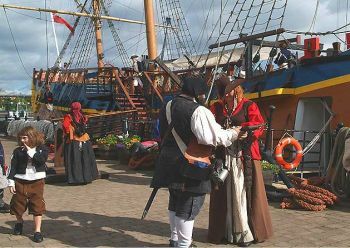 A guided tour of the Replica HM Bark Endeavour creates many learning opportunities in line with the National Curriculum. Special rates for school or college groups are offered @ £2.50 per head. The tours last approximately 45 mins. and can be accommodated in guided groups of 25 people with a maximum of 50. The price of the tour includes a soft drink served on the Mess Deck and a commemorative map of the voyages of Captain James Cook. Born: October 27th 1728. Died: February 14th 1779. This unique venue hosts a variety of themed evenings for you to enjoy. Dressing in character is encouraged but is optional. Our aim is to make your event an evening to remember. Aloha! Hawaii Night Sailors and grass skirts abound. Pirates Feast With grub and grog to suit the mood. The Captain's Table Maybe you will have to be on your best behaviour? Explorers and Missionaries Night Hot and Spicy. Shipwreck Party Come as you are, you won't be disappointed. Murder Mystery Whodunnit? The Surgeon? Bosun’s Mate? The Cabin Boy? As an outstanding sea captain, navigator, cartographer, and practical dietician, James Cook, on his three world-circling voyages, discovered more about the Pacific, the South Atlantic, the southern Indian, and the Arctic and Antarctic oceans than had been seen or imagined by all other navigators during the preceding two and one half centuries. He defeated scurvy, established precise navigation as a common sea skill, and changed the face of the Pacific from the world of myths and mystery to the map we know today. James Cook was born on October 27th 1728, in the village of Marton near Middlesbrough, the son of a farm labourer migrant from Scotland. After a short time in a haberdasher’s shop at Staithes, at the age of 18 in 1746 he was apprenticed to a well known Quaker ship owner, John Walker of Whitby, and at 21 was rated able seaman in the Walker collier barks mainly in the North Sea trade. Promoted to mate in 1752, Cook was offered command of a bark three years later, after eight years at sea. Advancement of this nature opened up a career that would have satisfied most working seaman, but instead Cook joined the Royal Navy in 1755 as an able seaman. The navy, he was sure, offered a more interesting career for the competent professional seaman and greater opportunities than in the North Sea barks. Cook soon became mate, and within four years became a master. In 1759 during the seven years war between Great Britain and France (1756 – 1763) he saw action in the Bay of Biscay, was given command of a captured ship, the Mercury, and took part in the siege of Louisburg in Nova Scotia and in the successful amphibious assault against Quebec. His charting and marking of the more difficult reaches of the St Lawrence River contributed to the success of General Wolfe’s landing there. Between 1763 and 1768 after the war had ended, Cook commanded the schooner Grenville, spent four years surveying the coasts of Labrador, Newfoundland, and Nova Scotia. He also studied mathematics in order to master the science of navigation. His charts of the coasts, considered both important and accurate, were published. Cook had observed a solar eclipse in 1766 and used it to determine the longitude of Newfoundland. These findings were published in the Transactions of the Royal Society. After his return to England in 1767, Cook was commissioned a lieutenant in the Royal Navy. In 1768 the Royal Society requested the Admiralty’s aid in observing the transit of Venus at Tahiti, to occur in June 1769, and Cook was given the command of the expedition. Secret instructions made clear that Cook also was to search for Terra Australis incognita, the “Southern Continent,” which philosophers argued must exist to balance the land masses of the Northern Hemisphere. Cook and the Endeavour left Plymouth on August 26th 1768. In addition to its crew the Endeavour carried two botanists- Joseph Banks and Daniel Solander, as well as astronomers (Cook rating as one) and artists. Cook carried an early nautical almanac and brass sextants, but no chronometer. The Endeavour travelled by way of Madeira, the Canary and Cape Verde islands, Rio de Janeiro and rounded Cape Horn into the Pacific Ocean. Cook carried good provisions and citrus fruits thus avoiding the plague of scurvy. The ship reached Tahiti in April 1769. During their three months there, the scientists examined the island thoroughly and observed the transit of Venus on June 3rd. They sailed West with a Tahitian guide through the Society Islands and then Southward, finally reaching land on October 7th 1769. Cook had rediscovered New Zealand, originally discovered by Abel Tasman in 1642. He spent several months circling and surveying North Island and South Island, proving that they were islands and not a continent. The expedition then sailed West, reaching the unexplored eastern coast of Australia, which he charted and claimed for Great Britain. Sailing North, Cook saved the Endeavour after it struck and was grounded on a coral reef. Overall about 3200km (2000 miles) of Australian coast was surveyed. Cook also confirmed the existence of a passage between Australia and New Guinea (The Torres Strait). The expedition sailed on, refitted at Batvia (Jakarta) in Java, and although the crew had been remarkably healthy until then, 30 died of fever and dysentery contracted while on land. None of the crew however died of scurvy. The expedition returned by way of the Indian Ocean and the Cape of Good Hope. It reached England on July 13th 1771. The HM Bark Endeavour sailed from the sheltered waters of Plymouth in England on August 26th 1768, sailing alone with no other vessel as support ship. She carried 94 officers, scientists and crew, two greyhounds plus a milking goat and stores for the voyage. As she was originally built to carry a crew of 17, she must have been bursting at the seams. The HM Bark Endeavour returned to port in 1771, a voyage of three years, having been reported missing, lost to the unknown sea. But the battered Whitby built ship with pennants flying and the great Royal Navy Ensign clearly to be seen on her quarter deck, sailed up the Channel and anchored off the Downs. There were only 56 on board now plus the indestructible goat. Because the first voyage had not totally disproved old legends of a major southern continent, the Admiralty soon authorised a new expedition. Cook commanded the Resolution, which was accompanied by the Adventure, and again took scientists and artists. They left Plymouth on July 13th 1772, and headed for the Cape of Good Hope. Then they travelled south, crossing the Antarctic Circle in January 1773. Finding no continent, they went on to New Zealand and from there explored the South Pacific. The Resolution and Adventurer lost contact, and the latter returned to England, becoming the first vessel to circumnavigate the world from west to east. The Resolution, however, again crossed the Antarctic Circle, reaching latitude of 71 degrees 10 min. South, stopped at Easter Island and Tonga, and explored the New Hebrides, New Caledonia, and Norfolk Island. Finally it crossed the South Pacific again, rounded Cape Horn, crossed the South Atlantic to the Cape of Good Hope, and then sailed north to reach England in July 1775. Only one man had been lost to disease on the entire voyage. Cook had proved that no great continent existed in the temperate region of the Pacific, but he had become convinced that there was an Antarctic continent. As a result of his successful expeditions, Cook was elected a fellow of the Royal Society, and awarded one of its highest honours, the gold Copely Medal, for a paper he prepared on his work against scurvy. Promoted to captain, Cook sailed again on the Resolution on July 12th 1776, this time to search for the Northwest Passage from the Pacific side. At the Cape of Good Hope he was joined by another Whitby ship, the Discovery. The two ships visited Tahiti. They also discovered Christmas Island and then the Hawaiian Islands, which Cook Called the Sandwich Islands, in January 1778. Sailing onward to North America, the expedition landed at Nookta Sound, near Vancouver, and then went through the Bering Strait into the Arctic Ocean. This search was unsuccessful, for neither a Northwest nor Northeast Passage usable by sailing ships existed and the voyage led to Cooks death. The ships returned to Hawaii for repairs, and Cook was killed there in a skirmish with the Polynesian inhabitants on February 14 1779. The expedition then returned to England. James Cook had surveyed and charted thousands of kilometres of coast and had solved many mysteries of the Pacific Ocean area. He had also opened the Northwest American coast to trade and colonisation. James Cook handled ships and crew extraordinarily well, avoided scurvy, and conducted all of his explorations in a remarkably peaceful fashion. 1768 16th February - George III is petitioned by the Royal Society to finance an astronomers voyage to the Pacific. 29th March - The “Earl of Pembroke” was purchased for £2307 5s. 6d. The ship is renamed HM Bark “Endeavour”. 25th August - “Endeavour” leaves Plymouth. 12th-18th September - “Endeavour” anchors in Madeira. 13th November - “Endeavour” anchors in Rio de Janeiro to take on provisions. 1769 25th January - “Endeavour” rounds Cape Horn. 13th April - “Endeavour” reaches Tahiti. 13th June - The transit of Venus is observed and recorded. “Endeavour” sets sail to explore the Society Islands. 7th October - “Endeavour” makes land fall on the East Coast of North Island, New Zealand. 4th November - The transit of Mercury is observed and recorded. 14th December - “Endeavour” rounds the North Cape. 1770 31st March - “Endeavour” leaves New Zealand and sets sail for “Van Diemans Land”, Tasmania. 29th April - “Endeavour” anchors at Botany Bay. 10th June, “Endeavour” strikes the Great Barrier Reef during the night. 18th June - 4th August, “Endeavour” is beached in Endeavour River in order to repair her hull. September - “Endeavour” anchors off Timor. 10th October - “Endeavour” anchors at Batvia. Many of the crew become sick with malaria and die. 26th December - “Endeavour” leaves Batvia with many of the crew still sick. 1771 15th March - “Endeavour” anchors in Table Bay, Capetown. 4th May - “Endeavour” leaves St. Helena for the voyage home. 13th July - “Endeavour” anchors in the Downs and reaches the end of her expedition. 1728 27th October - Born at Marton , Cleveland England. 1735 Family move to Aireyholme Farm. 1740 Schooling at Great Ayton. 1745: Works in Sandersons shop in Staithes. 1747 Apprenticed to the Walker family of Whitby. 1748 Servant on the “Freelove” October ’47 – April ’48. 1749 Seaman on the “Three Brothers” June ’48 – December ’49. 1750 Seaman on the “Mary” February ’50 – October ’50. 1751 Seaman on the “Three Brothers” July ’51 – January ’52. 1752 Mate on the “Friendship” March ’52 – June ’55. 1755 Joins Royal Navy on the “HMS Eagle” as able seaman. 1757 Master of “HMS Pembroke”. 1759 Master of “HMS Northumberland” taking part in surveying the St. Lawrence River, Canada. 1760 Surveys Newfoundland St. Pierre, Miquelon off the coast of Canada on “HMS Grenville”. 1761 Lord Colville, Commodore of the North American squadron mentions Cook in his journal. 1762 Returns to England and on 21 December marries Elizabeth Batts, at Barking East London. 1763 April to November - surveying the coast of Newfoundland. Son James born 13th October (He dies age 35). 1764 14th June - joins as master of HMS Grenville in St Johns harbour for further survey work in Newfoundland. 14th - December arrives back in England, second son Nathaniel born on same day. (He dies age 17). 1765-67 Spends the summers surveying in Newfoundland and winters drawing charts in England. 1767 Daughter Elizabeth born (She dies age 4months old). 1768 Promoted Lieutenant and given command of HM Bark Endeavour. Son Joseph born August (He dies age 1 month). August 26th - the HM Bark Endeavour, sails on first voyage of discovery. 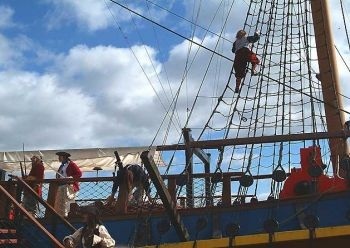 1771 July 13th - the HM Bark Endeavour returns home. 1772 Son George born June (He dies aged 4 months). 1772 July 13th - the Resolution and Adventurer sail on the second voyage around the world. 1775 July - the Resolution returns home alone. 1776 Son Hugh born (He dies aged 4yrs). July 12th - the Resolution and Discovery sail on the third voyage around the world. 1779 February 14th - Captain James Cook killed at Kealakekua Bay, Hawaii. He was 50yrs of age. 1780 October - the remnants of that fateful third voyage return to England. In 1768, the Admiralty purchased a cat – built (bluff bow) collier named the Earl of Pembroke to be converted for Cook’s expedition. She was a three – masted square-rigger, built in Whitby in January 1767 she was used for transporting coal from Stockton on Tees, London and Northern Europe. The Earl of Pembroke was a sturdy built vessel, originally designed to carry coal and timber in her broad, flat hull. Although she was not very fast, her unusual convex shape meant that she had a large hold for provisions and was ideal for sailing in the shallow waters of the South Pacific. The Earl of Pembroke was converted and fitted out at Deptford dockyard in 1768 and renamed HM Bark Endeavour. The Admiralty had ship builders’ plans of the vessel drawn up during her refit, which are still in existence. A lot of work had to be carried out on the vessel to make her suitable for the journey. The hull of the collier was sheathed and caulked to protect her from the tropical marine worms. As one hundred and seven people had to be accommodated for the long voyage, a third deck had to be squeezed into the ship, to house extra cabins, storerooms and the galley. From Deptford, HM Bark Endeavour sailed down the Thames to Galleons Reach to take on her compliment of guns, before she set sail for Plymouth to provision and take on crew. HM Bark Endeavour set sail from Plymouth on 25th August 1768 to begin her long voyage of discovery. Length 32 metres (106 feet). Beam 9 metres (29 feet). Weight 400 tonnes (397 tons). Sail Area 897 square metres ( 9964 square feet). Three Masts Main mast height - 39 metres (128 feet). Fore mast height - 33 metres (110 feet). Mizzen mast height - 24 metres (79 feet). Compliment 107 officers, scientists and crew plus animals and stores. Boats She carried three small boats: The Yawl, the Pinnace, and the Longboat.